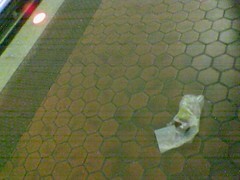 A fallen muffin sits, lost and forlorn, on a metro station platform. Somewhere in DC, someone has missed breakfast. Weep for the poor muffins! The sad thing is that if you put the muffin’s photo on the side of a milk carton, people would probably just think it’s a recipe for muffins. Will no one think of the muffins?!? !